Girls and Juniors School uniforms including pants, skirts, skorts, long and short sleeve tops and blouses. Brand names like French Toast and Dickies. A traditional favorite, these sweatpants are made with a comfortable 8 oz. 50/50 cotton poly blend fleece. Covered elastic waistband and elastic leg openings with inside white draw-cord. No side seams or pockets. Nine colors in sizes from S-XL. This short sleeve unisex polo comes in sizes 4-20 and features a three button placket with dyed to match buttons. 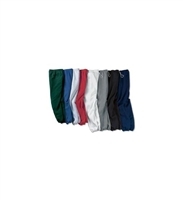 The Dickies five pocket pant is a low rise, skinny leg pant. Made with 8 oz. stretch twill, it has a button front and authentic Dickies patch logo on right rear pocket. A mid rise pant made with stretch twill. The Worker Pant is a boot cut straight leg pant with two rear pockets and a button front. Dickies patch logo on right rear pocket. Dickies Women's Flat Front Straight Leg Pant is wrinkle/fade resistant and has Scotchguard Stain Release. Hook and eye closure with a right back welt pocket. Mechanical Stretch Twill and a stretch interlining at waist for comfort. Premium construction. A traditional girls crew-neck sweater with two front pockets, dyed to match button front, and rib knit collar, cuffs, and waistband. Machine washable anti pill acrylic fabric to keep it looking good. The flat front pant features a wrinkle resistant finish, adjustable waist, side pockets, hook and eye closure. The French Toast Girls Half Size Adjustable Waist Flat Front Pant offers harder to fit half size girls a basic flat front uniform pant. Long Sleeve polo with three flower button placket. Picot trimmed collar and ribbed cuffs. Machine washable. Dickies Short Sleeve Polo fits boys and girls and comes in 15 colors. The front placket features three dyed to match buttons. This cotton/poly blend polo shirt also has stain release and no exterior logo. A classic pleated v-neck jumper. Full circle permanent pleats with hidden side zipper and button closure. Machine washable, 100% polyester. A very popular item, the French Toast Girls Polo has flower shaped buttons. A rib knit collar with picot trim and ribbed cuffs for added style and comfort. Machine washable and available in four popular school colors-White, Blue, Yellow, or Burgundy. Classic Peter Pan rounded collar short sleeve blouse with button front. Cotton blend with "Wrinkle No More" fabric. The Jerzees Kids Sweatpants have all the same features as the adult version. Covered elastic waistband and elastic leg openings with inside white draw cord. No side seams or pockets. Five popular school colors in sizes from S-XL. This short sleeve unisex polo comes in sizes small to 2XLarge and features a three button placket with dyed to match buttons. 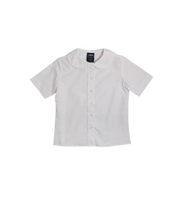 The Short Sleeve Uniform Blouse from School Apparel features a rounded collar(Peter Pan Style) with dyed to match buttons. Made from a 65/35 poly cotton blend, it also has a one piece back and a no pocket front. Three basic school colors-white, blue, or yellow in sizes from Youth 4 to Adult 3XL. The Short Sleeve Uniform Blouse from School Apparel features a pointed collar with dyed to match buttons. Made from a 65/35 poly cotton blend, it also has a one piece back and a no pocket front. Three basic school colors-white, blue, or yellow in sizes from Youth 4 to Adult 3XL. This long sleeve unisex polo comes in sizes 4-20 and features a three button placket with dyed to match buttons.